I wrote a post before about Coca-Cola and Pepsi in Japan offering unusual flavors such as “Green Tea Coke”, “Cucumber Pepsi”, and “Shiso Pepsi”. (Click here to read that post). 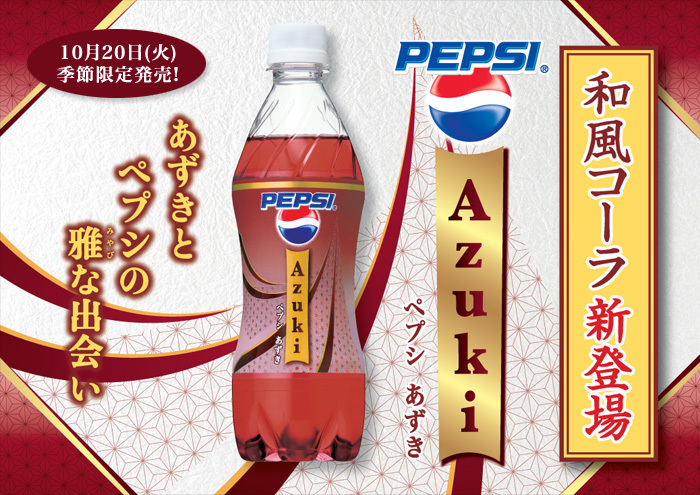 Pepsi Japan will be offering their latest flavor starting on Tuesday, 20 October (2009)….「ペプシあずき」 (“Pepsi Azuki“). Pepsi Japan's ad for "Pepsi Azuki". On sale (in Japan) starting 20 October (2009) for a limited time. The ad says 「和風コーラ・新登場」 (“Japanese style cola. A new appearance.”). 「小豆」 (Azuki) is a popular red bean in Japan that is often eaten in a sweetened paste form. It’s quite good. But, though I like Shiso, I didn’t think much of Shiso Pepsi…so I have my doubts about “Pepsi Azuki“. Also just bought a bottle of Pepsi Azuki today and our family had mixed reactions. See my blog post at http://bartman905.wordpress.com/2009/10/25/pepsi-azuki/, with a reference back to your original post. I just read your post about it. I bought a bottle of “Pepsi Azuki” today. My family and I all disliked it! I was surprized a lot when I saw shiso-cola on shelf at convinience store, and then next azuki?? oh. no thank you! I tasted shiso and it was nicer than what I expected. But… don’t want to buy azuki. Azuki is a special bean we use for Osekihan, or red bean rice for cereblation on special occasion like wedding, entering or graduating to ,from school, company, and on festival. Oh..at last it has become a fast-drink ?? I’m sure they will make those drinks if they think they will sell well! This kind of bean isn’t like the beans in “Chili Con Carne“. 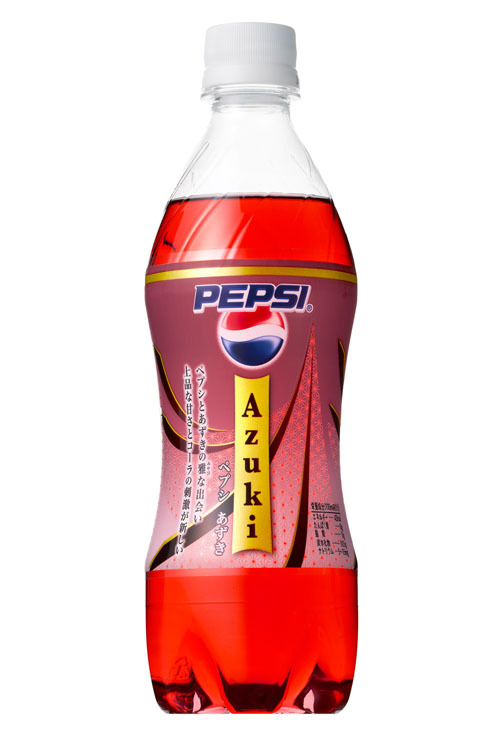 When it goes on sale, I think I’ll try Pepsi Azuki when it goes on sale…just for the novelty value. I want to try that, I like red bean paste! Yes, I eat them on occasion, They are kinda expensive here, so I’ll sometimes treat myself to them. I’ve got quite a sweet tooth! Although, I prefer chocolate the most. OK. I can’t imagine anpan being expensive! Do you prefer Japanese or American chocolate? I don’t eat sweets much…but I much prefer Japanese chocolate over American! I like all kinds of chocolate, except for the VERY dark (over 80% cacao) is a bit too much, and not sweet enough. As for me, if I eat chocolate, I like bitter (dark) alot more than milk-chocolate. And chocolate-covered almonds are good. LOL, My chocolate with alcohol of choice is generally rum, although I also like it with raspberry schnapps! I have no idea what Azuki tastes like, but I’m pretty open about trying new food and beverages. I’ll try anything too. And I’m not a picky eater…I like most food (including Azuki). But I don’t drink much cola. What will the Japanese think of next??? I wouldn’t mind taking a swig of Pepsi Azuki, since I love the azuki in shaved ice and dim sum — both popular in Hawaii. Azuki on shaved ice is popular in Japan too.